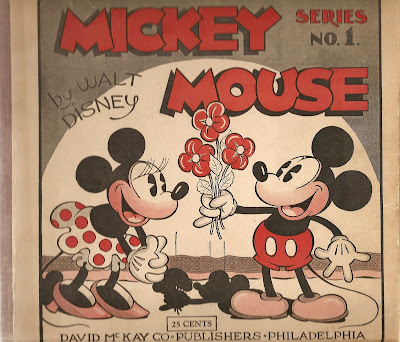 The first-ever Disney comics book published in the US is titled as Mickey Mouse Series No. 1. 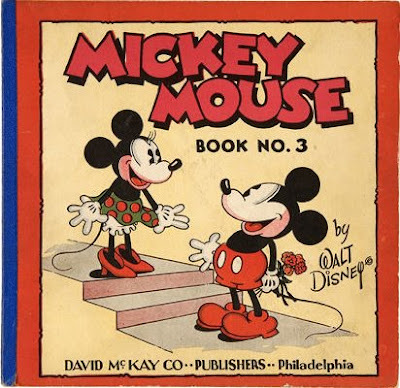 It was published by David McKay Co. in 1931 as the first installement of a series of annual comics albums reprinting select Mickey Mouse newspaper comics. 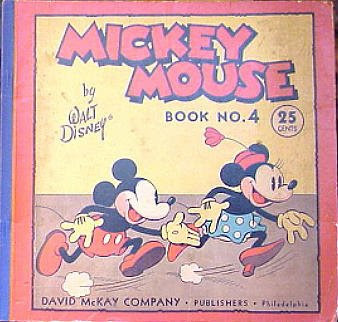 It is in the format of other comics albums published in the 1930s by McKay reprinting other popular newspaper comics such as Popeye, that is roughly in square shape with cardboard cover (the book is slightly larger size than my scanner's area, so the above and below scans trim approximately 1 cm length from both the top and the bottom). This re-formatting, which breaks each daily strip (originally of one row) into two rows, is nevertheless quite acceptable because each page still has one daily strip, so the original intent of the original creators with regards to rihtym is faithfully reproduced. 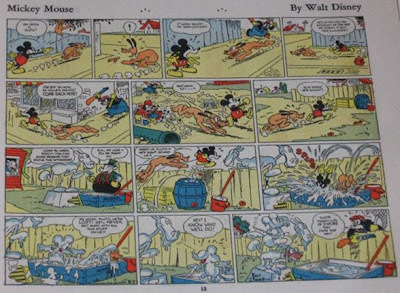 In the original newspaper run of the strips, Slicker was eventually revealed to be a fortune-hunter, but the reprints in Mickey Mouse Series No. 1 jump from Mickey qiving up his futile suicide attempts to a series of loosely-related gag strips where he and Minnie have united. These are originally dated from Dec. 27th to Jan. 14th; the volume ends with one more reprint of a gag strip, dated Jan. 17th. The reverse of the back cover is blank and the back cover itself carries the same illustration as on the front cover. We do not know precisely in which month Mickey Mouse Series No. 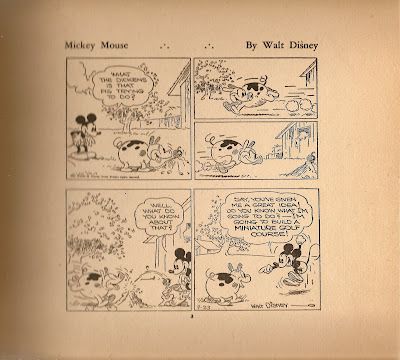 1 was printed, but since it carries an ad for the first printing of the illustrated story book The Adventures of Mickey Mouse, which had come out around May, it must have come out around either mid-1931 or in the 2nd half of the year. 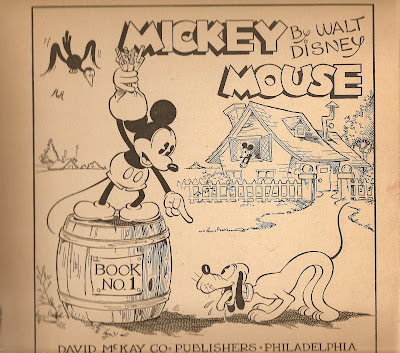 This estimate disqualifies it from being the first-ever Disney comics book published in the world because a French album, titled Les aventures de Mickey, reprinting Mickey Mouse strips had already been published in France by Hachette around March that year. And even before that, a Mickey Mouse Annual, featuring short gag comics beside non-comics material, had been published in UK around the Christmas season of 1930. This book once again reprints daily strips in black&white. The strips reprinted in this volume are all from 1931. First, there is a continuity from early 1931 in which Mickey engages in a series of fights with a new cat in the neighborhood. This continuity has never been reprinted in the US again, perhaps because of its violent contents. Then, there is another continuity from late 1931 in which Mickey decides to play the cupid. Only parts of this continuity entailing a subplot where Mickey works as a fireman has seen further reprints. I have this book/comic/magazine. Does it have any value? I would like to sell it to someone. It is in good condition.